Pitcher son's new chapter as a Javelina! 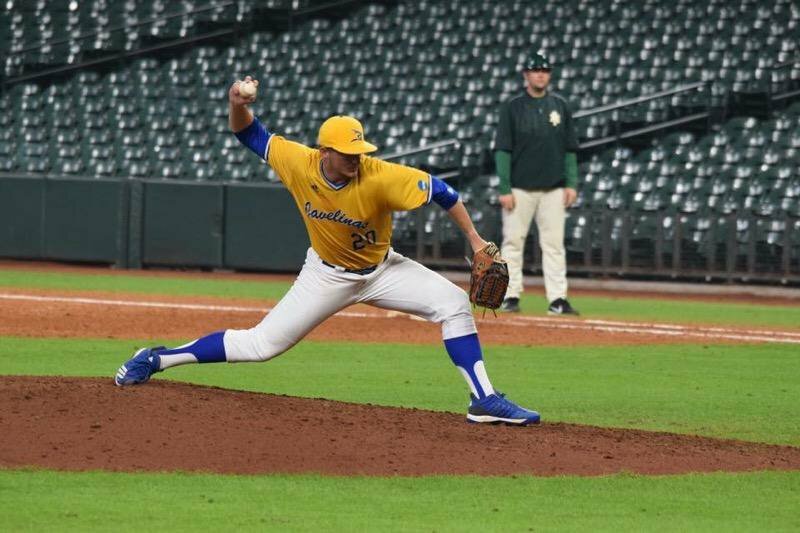 Son's new team Texas A&M- Kingsville's Javelinas opens their season in Houston tomorrow at Minute Maid Park! The nation's fifth-ranked D2 team opens the weekend series against St. Cloud at 1:30 pm. 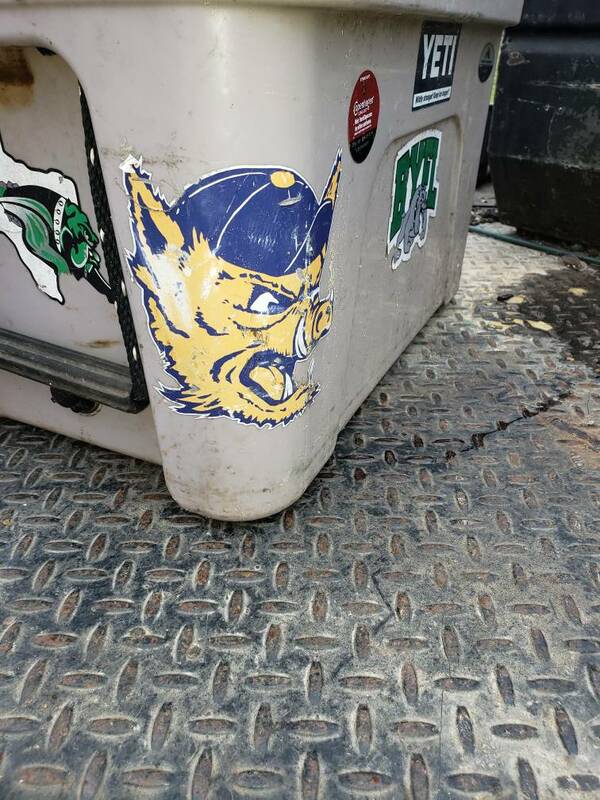 TAMUK was the only Texas team to make last year's D2 World Series, and has a nice group of returning players, although they lost a lot of pitching. Coach Gonzales' pitching corps has been bolstered by some JUCO transfers in addition to my son Eric, who was at the University of Nebraska - Kearney last year. The school announced that they were eliminating the sport a week into the season last year, and Eric went on to become the closer and get nine saves, which ended as tied for 19th in all of D2. As a senior now, Eric hopes to continue at the next level following this season. Hoping to get the attention of scouts as a submarine reliever who gets a lot of off-center contact but still averages better than a strikeout an inning. Can hit 85 from the low arm angle. Here's a brief clip of part of his warm-up at UNK last year. Last edited by tradtiger; 01-31-2019 at 10:28 PM. Didn't get up to Nebraska much to get a lot of video for a highlight reel. But here's a clip from his time at Navarro. Hope he has a great year! If they come up to Cameron and play our boys. I'll be sure and go meet him. Good for him for keeping at it. Hope he has a great year and you get to attend a lot more of his games. Very cool! I sure miss playing baseball. But I got a lot more hunting and fishing in when high school ball ended! I have been following your son and said when you first posted a clip of him on TBH that he will do well as a reliever. I know he will make the minors. Maybe we will see him up here in Round Rock with the Express some day soon. Hunt In: Will work for hunts. Congratulations to your son. I know Coach Gonzales (Jason) very well. He is a great guy & coach. He was a very good high school athlete. He is from Cuero Texas. Congrats! Best of luck to him this season. Good luck to your son. He may have a shot as a undrafted FA. My buddy signed a few and played with a few. They all fizzled out. He thought Dorris with the Astros had the best shot. But he didn't make it. Good luck to your son and congrats! Hunt In: Lavaca, Fayette & Colorado Co.
My cousin was the pitching coach for coach Gonzales a few years back. Luke Prihoda After a stint in the minors, he went back to get his masters and coach. Life changing experience for him. Literally. Good luck to your boy. Awesome! I bet you're glad to have him a little closer to home! Man I remember playing against Prihoda and Kasparek. I went to school at Tidehaven and they were in our district. Those boys could sling it. Thanks for the well-wishes, y'all. I know he'd enjoy meeting you, Dave. Tracker, I know you've been following for a while. Nice vote of confidence, too. As far as Coach Gonzales goes. I'm very impressed with him! BTW, anyone wanting to follow the current game can get written play by play by going to the TAMUK baseball site, pulling up the schedule and clicking on "live stats" for today's game. Thanks, Strummer; Eric does like the guys and coaches. I got to meet quite a few along with playing some golf with a couple of the coaches at their fund-raising golf tourney in the fall. Seem solid. And, Michael: thanks, and I am glad to have him closer to home! That's awesome - I played D2 myself. BTW, you might suggest he toe the rubber on the other side as far as he can rather than the left side. Right-handed side arm from the right side of the rubber makes the ball look like the short stop is throwing it to a right handed batter. Scares the bajeebers outta them. I know a couple of the players there. My son played summer ball with several of them. They have a great program. Good luck to your son. My Aunt coached track there back in the 80s. Her picture is on the wall of the basketball stadium I believe. Thanks. As far as going to the third base side, I'll pass that along. Update on last night's game in Cleburne versus Oklahoma Baptist in the Alpine Fresh 4-Him Classic. Eric entered in the seventh -- down 2-1 -- and held OBU scoreless the rest of the way, while TAMUK took a 3-2 lead. He earned the win in allowing only three hits while striking out 6 of the 13 batters he faced, with no walks. Apparently, playing in frigid conditions in Nebraska last year was good prep for the windy mid-30s last night. Cold baseball. Hate it. Great game for your boy though, congrats. Thanks. I don't like cold baseball, either. Last year in Kearney, NE, watched games at 32 and 33 degrees -- in March. I guess it takes a lot of focus and adrenaline to overcome such elements. Just occurred to me that the brief video of Eric's warmup in the first post of this thread was shot during the 33-degree game in Nebraska last year. Javelinas play St Mary's in San Antonio Saturday at 1 p.m. I'll be there as well as for the 4p.m. scheduled game. Love to meet any TBH'ers who happen by. Just ask for Eric's Dad. Games are also being video-streamed live by going to the TAMUK schedule and clicking "watch" at the St Mary's game details. St. Mary's won this afternoon's game 8-4. Eric did not play. Javelinas Won both games today versus the St. Mary's Rattlers in San Antonio: 9-6 in the early game and 6-3 in the late game. Eric picked up his first Save of the season, going 3 innings, allowing No Runs on 1 Hit, with 1 Walk and 5 Strikeouts of the 11 Batters Faced. Brings him to 11 Ks in 6.1 Innings Pitched; with 1 Win and 1 Save for the Season, so far. Javelinas won the first game of a doubleheader just now 3-2 over the Uonniv. of Missouri - St. Louis. Eric got the Save. He struck out 2 of the 3 batters he faced and assisted in a put-out of the third batter, who grounded to the first baseman. So, no runs, no hits, no walks. Here's a picture from a couple of weeks ago. Forgot to mention that this latest appearance brings his strikeout total to 13k's in 7.1 innings pitched. Thanks, ZZ. Followed your daughter's achievements on the track. Fun watching them excel. Found out a cool thing. UMSL guys were shooting radar and had Eric at 86 mph from his submarine arm slot. Told him later, and he was surprised, saying he didn't feel very fast today. Can't make link work right if viewing TBH in Google Chrome. Seems to link alright in Explorer. Last edited by tradtiger; 02-26-2019 at 09:06 PM. BTW, meant to point out that Googling "Eric Sandoz TAMUK" should bring up the uncut inning (little over 5 mins.) versus UMSL for anyone wanting to see an unedited clip of quality Dad-shot video. The Javelinas came all the way back from a 10-run deficit amassed in the third versus the Hilltoppers of St. Edwards tonight. Eric got the win, entering with two on, two out, down a run in the top of the 8th in Kingsville. He struck out -- swinging -- the only batter faced that inning. The Javi hitters tied things in the home half of the eighth. Sandoz pitched a hitless top of the ninth -- overcoming a two-base infield error to strand the go-ahead run in scoring position. In the bottom of the ninth, TAMUK loaded the bases, with the help of an intentional free pass for the lead-off hitter, which led to a walk-off wild pitch win for the Javelinas. For Eric: that's 2 Wins, with 2 Saves; Striking out 14 over 8.2 innings while yielding only 6 hits. "Fantastic" was the word used by the streaming video announcer to describe Eric's outing today, as the TAMUK Javelinas won the final game of a four-game series against Angelo State Univ., 14-5, -- having dropped the first three games prior. Stepping out of his normal role as a short-term reliever or closer, Sandoz entered in the fourth inning of a one-run game and completed the game. He got the win in allowing only 2 runs on 5 hits, with 4 strikeouts over 6 complete innings. He threw 101 pitches, with 65 strikes. This is by far his longest outing since high school. For perspective, the two runs Eric allowed came against a line-up that scored 28 runs in the three previous games this weekend. As a proud Dad, I agree with the announcer's "fantastic" assessment and would add "beast" to describe this young man! Season stats now as follows: ERA 3.68; 14.2 Innings Pitched; 18 Strikeouts; has allowed 11 Hits and 6 Earned Runs over this span. Spoke with him just now; said he's all good. Iced a little. Said he figured he was in for the duration and pitched accordingly. Kind of burying the lead, though, as the Javelinas are playing the West Texas Buffaloes this weekend in Kingsville. The Buffs are currently ranked as high as third nationally. The teams split a double-header Friday and play again today and Sunday. Eric didn't appear in either game yesterday. WT took the first game 6-1, while TAMUK won the second 8-0. Will note that anyone interested in seeing at least live stats (written play by play) and often video streaming of games, can just log onto the TAMUK baseball site, go to Schedule, then scroll down to the particular game and click "live stats" to follow the action. Great game today versus highly touted 3rd ranked West Texas. Javelinas won 5-4, and Eric earned the Save, in support of starter Josh Vasquez and fellow reliever Garrett Alexander. Young man came in with runners on second and third, with one out in the 9th inning, leading 5-3. A fielder's choice grounder to third got an out but cut the lead to one -- and moved the tying run to third. Intentional walk to a .401 lefty brought a .433- hitting righty up who Eric got to pop up to shallow right for the final out. Only took Eric 9 pitches to get 2 outs to end it. Look at the link posted in the previous post for a very nice article on today's game. Tap "Recap" to see it. I'm techno-challenged to share actual article via phone. Great game today won by the TAMUK Javelinas 7-3 in the 13th inning on a walkoff grand slam by Pablo Hernandez. Eric got the Win after holding West Texas A&M scoreless for the final three innings. He took over for Garrett Alexander after the 10th.